A bathroom remodel is an exciting project to embark on – who doesn’t want to transform a dated bathroom into a pleasant spa-like oasis? If you’ve been eyeing home improvement magazines lately, you might be ready to begin your own project. Before you pick up the hammer and tile saw, however, you’ll need to spend some time thinking about the project you’re taking on. Bathrooms are the smallest room of a home, and many people believe this makes them the easiest to remodel. However, tackling a bathroom remodel can either be a small project or a massive one. You could do something as simple as change the tile floor, or a more major task like knocking down walls and redoing plumbing. There’s a lot to consider before you pick up your hammer and begin the remodel. Here’s what you need to think about before you remodel your bathroom. The budget for your bathroom remodel will set limitations for your project. Unless you’re sticking to a few simple cosmetic changes, expect your remodel to cost several thousand dollars. Finalizing your budget before you begin your remodel can guide you on each decision you need to make. Settling on a budget in advance also gives you time to save money or secure financing for the bathroom of your dreams. As you draw up your budget, you’ll need to include the cost of materials and labor for any jobs you can’t do yourself. Stash away some extra money for any unexpected problems that may arise. Bathroom remodels don’t happen overnight; depending on the scope of your vision and how many workers your budget can afford, a full remodel can take a few weeks or a few months. 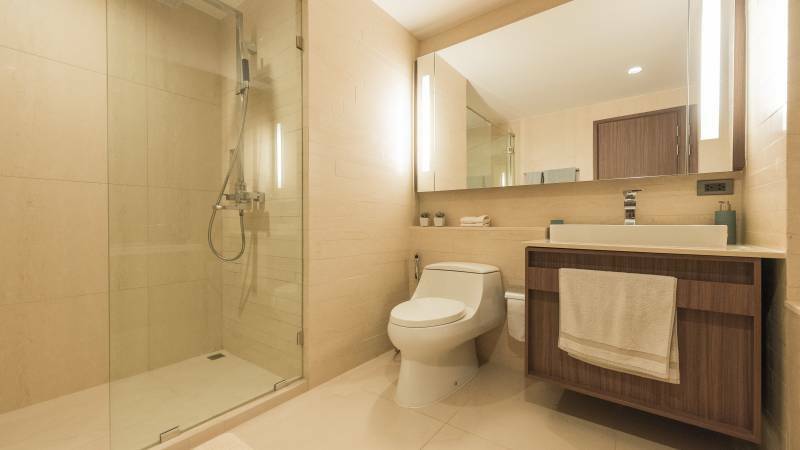 If you have multiple bathrooms or a small family, the timeline might not be a huge concern to you. However, if you only have one bathroom, you’ll need to plan carefully to avoid inconveniencing your family. This might require staying elsewhere while the most essential work, such as the installation of a new toilet, is completed. Changing the layout of your bathroom fixtures can dramatically transform the room and allow you to add new features. However, moving fixtures around may force you to reroute your plumbing – and this can eat up your entire budget. If you can stand to stick with your current layout, simply replacing the existing fixtures will still give the room a new look and allow you to shift your budget into new features or improved materials. Bathrooms are typically quite small in size, limiting the wild ideas you can entertain for transforming the space. If you’re not just replacing the existing fixtures and cabinets, you’ll need to do some careful and precise measuring before you get started. While having a larger shower is a luxury, you won’t enjoy having to contort your body to move around the bathroom. If you have the spare room, or the budget to knock down walls, then you can add extra features, such as a soaking tub. When you’re drawing up your budget, it’s easy to focus solely on the cost of the labor, fixtures, flooring, and other essential features. However, you’ll need to allocate some funds for styling your new bathroom. Small accessories, such as a toilet paper holder, may not cost much on their own. As you add more decorative touches, however, your decorating budget will increase. Avoid going overboard with decorations; a few simple touches can still make a cohesive design theme. Though you might not think a bathroom remodel needs to be environmentally friendly, it does provide a chance to make your bathroom a bit greener. You can install energy-efficient fixtures throughout the room. Installing a low-flow toilet and showerhead, for example, prevents excessive water waste, and helps you save on your utility bills. LED lightbulbs provide good lighting, use less electricity, and last for years. You can also go green by choosing the materials used in the remodel carefully, like cabinets built with wood from sustainable sources. A bathroom remodel is rarely without issues. During construction, you may discover previously hidden water damage or pipes in desperate need of replacement. If your budget has some spare money and your timeline isn’t tight, minor issues shouldn’t set you back. Extensive problems will likely require professional assistance and a higher price tag, so make sure you consider what might go wrong ahead of time. Before you get started on your remodel, it’s a good time to think about special features that you’d like to add to the bathroom. If you have an aging parent living with you, adding safety bars to make it easier for them to maneuver in the bathroom is a smart idea. Adding faucets that are easy for children to use can make your young children less resistant to washing their hands. Heated floors add an element of luxury and comfort, especially if your tiled floors are often icy cold in the morning. All of these can change your bathroom’s appeal and make it perfectly suited for you. Remodeling your bathroom isn’t easy, but the finished project will give you a transformed space that the whole family will appreciate. Hiring a quality contractor can help you tackle some of the most difficult aspects of the renovation, from the early planning stages to the actual work. It may be tempting to save some cash by remodeling the bathroom yourself, but you’ll end up costing yourself more by wasting materials and time on challenging tasks and installations that you’ve never done before. Save time and money by searching for a local contractor who’s a remodeling pro – and you can find many different contractors with an easy, quick online search.